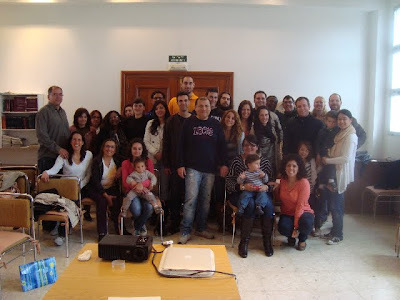 Last Saturday, the follow-up meeting to the Llamados conference was held in Malaga. Full-time staff, associate staff, students and friends from Cádiz, Granada and Málaga showed up to remember the topics from our Llamados conference held in Girona last October 2011. Once again, they were challenged to reflect on the world situation and the needs of those around us. Some of the staff from Granada shared a series of principles that can help us draw close to those in need, to understand their hearts, their pain and to show them care and love. All these principles are based in the example that Jesus gave us. It was a good day, not only for what was recalled and learned anew, but also for the opportunity to get together with friends and fellow staff. A total of 30 people attended the meeting, among them was a great group of students from Málaga and Granada who were highly motivated to contribute to the mission of building bridges to help change lives.